Evo Morales, who won Bolivia’s presidential election on vows to end a U.S. campaign against coca growing, stepped up his criticism of American anti-drug policies on Monday, accusing Washington of using drug fighting efforts to militarize the region. In his first news conference since claiming victory on Sunday Morales — who took a surprisingly strong majority and will be Bolivia’s first Indian leader — insisted he was opposed to drugs but disputed Washington’s methods. “The fight against drug trafficking is a false pretext for the United States to install military bases and we’re not in agreement,” he told reporters. “We support an effective fight against drugs. Neither cocaine or drug trafficking are part of the Bolivian culture,” he said in his stronghold of Cochabamba as the first official results from Sunday’s vote trickled in. Washington considers Morales, who first rose to power as the leader of the country’s coca leaf farmers, an enemy in its anti-drug fight in Bolivia, the third biggest cocaine producer after Colombia and Peru. A. M. Mora y Leon at Publius Pundit has a thorough roundup of yesterday’s election. Venezuelan President Hugo Chavez was the first to call and congratulate his socialist friend, Morales. 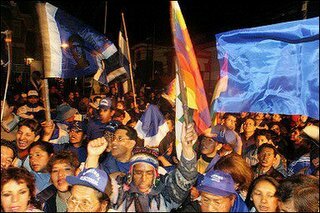 Morales said that with his victory “a new history of Bolivia begins”.